A thing of clean, minimalist beauty that speaks for itself. 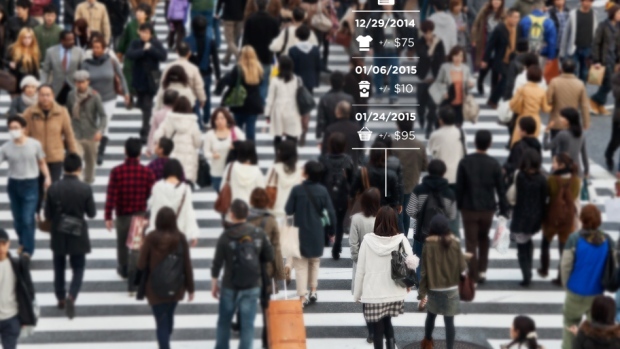 Large-scale data sets of human behavior have the potential to fundamentally transform the way we fight diseases, design cities, or perform research. Metadata, however, contain sensitive information. Understanding the privacy of these data sets is key to their broad use and, ultimately, their impact. We study 3 months of credit card records for 1.1 million people and show that four spatiotemporal points are enough to uniquely reidentify 90% of individuals. We show that knowing the price of a transaction increases the risk of reidentification by 22%, on average. Finally, we show that even data sets that provide coarse information at any or all of the dimensions provide little anonymity and that women are more reidentifiable than men in credit card metadata. I heard the NPR segment on this — and they made it sound so much more ominous and worrisome than does the abstract, which shows, by the nature of the data itself, how structured and specific it is. Not saying this isn’t dismaying – but as a would-be data science type, I can think of so many more interesting datasets to struggle with in which anonymized data would be useful, and presumably less easily reverse-engineered. oh, provided you’re using a non-free account, it’s basically one-click publishing of your data. Take that, SharePoint 2013! University Alum Club has slightly more contacts than organizations — and that’s fine. From Columbia Business School (henceforth “CBS”) Club’s perspective, anyone in the file who’s an alum of another club is likely either a programming partner (in which case they should more likely be affiliated with that club’s Board – but that’s not universally true) or if not a subject matter expert helping us with programming development, s/he attended one of our events, we got some money from them, and aggregating those (relatively small) sums at their club level is as defensible a way as any — and might help us track who to be extra solicitous towards. 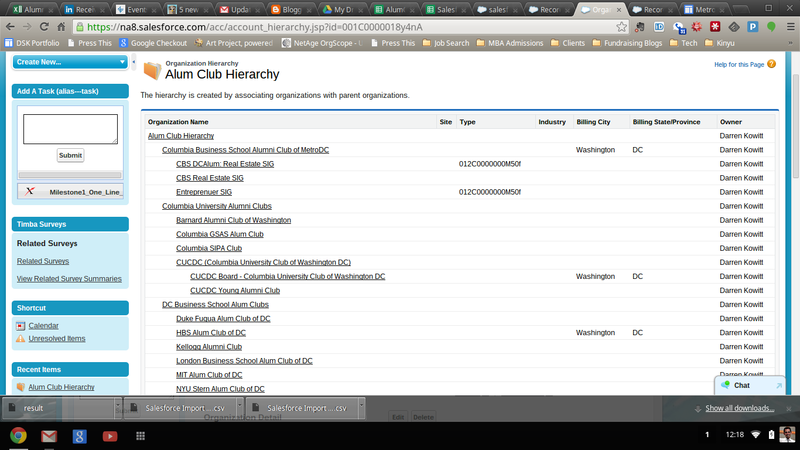 Alumni Club Head Hierarchies are a placeholder mechanism meant to unify relationships among clubs as is seen here. These records don’t represent anything real in the world — they’re just a convenient way to encode a hierarchical relationship in the database. The other MBA clubs seem sound enough — (though truth be told there are a surprisingly large number of clubs, so I’ll have to go double check that with some troubleshooting). But logically those MBA club’s members/public would be the most likely of any alumni to attend my programming, so it would only stand to reason that they would be accumulating many more members with attendance and/or revenue association with them for each organization I tracked. The CBS Alumni case is actually the weakest – and that phenomenon has two causes. But I’ll return to that explanation, which is lengthier, after I finish up the other lines. so anyway, the wonderful people (i just hate that word “folks”) over at +mulesoft have released this piece of goodness into the world. the interface is lovely to look at. nicest of all, the field select tool enables the user to select fields from first-level relationships among the Salesforce.com tables. so you can get, for example, the RecordTypeName instead of making do with the 15 digits of the RecordTypeID thus, the dataloader (or extractor: in any case, the person doing it, not the tool they’re using) is assured of an export that is human readable for a spot check before committing. 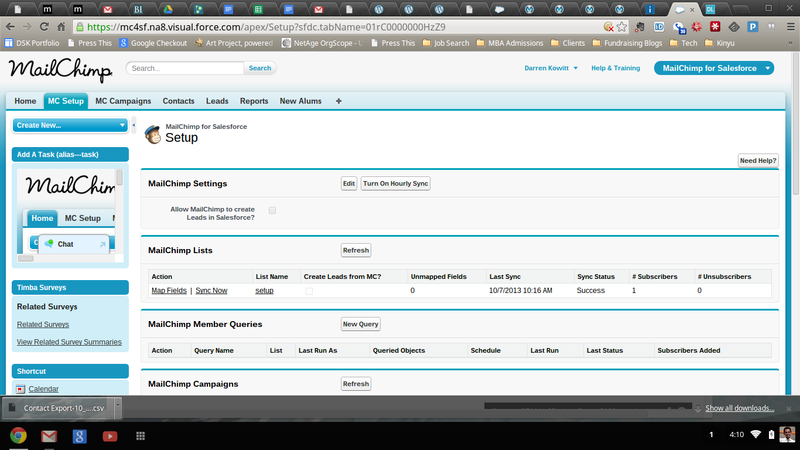 i’m getting ready to populate my new mailchimp account list so as to test the Salesforce.com-mailchimp connector. and Dataloader lets me set up a connection to DropBox and even schedule tasks. so ApexDataloader, so long: no love lost. hello, mailchimp. so long vertical response.